Hungary's House Of Fates Holocaust Museum Isn't Open Yet, But It's Already Causing Concern The government-funded House of Fates, set to open this year, has been criticized by Holocaust survivors, scholars and others for presenting a distorted view of Hungary's role during the Holocaust. 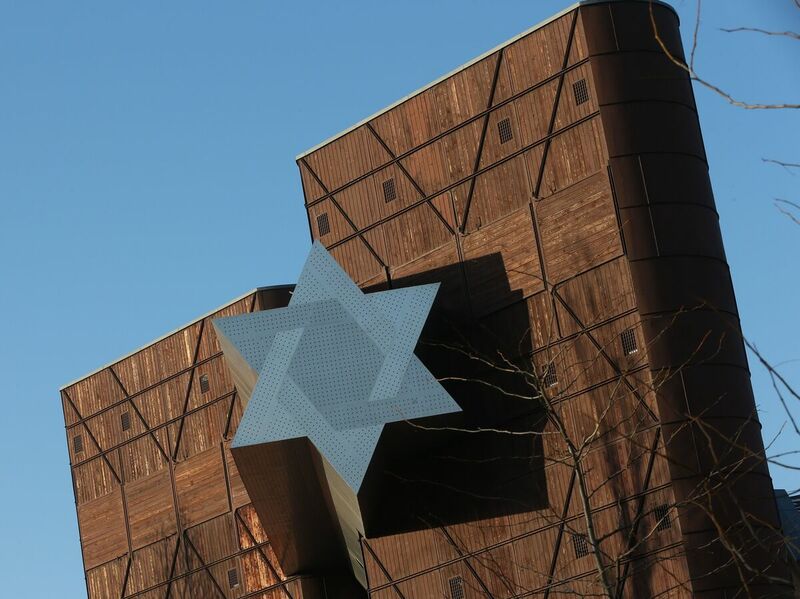 The long-delayed opening of the House of Fates Holocaust museum in Budapest, whose entrance is marked by a Star of David, is expected this spring. Nearly 75 years ago, Hungarian police forced Rozsa Heisler onto a train, along with thousands of other Hungarian Jews. "We were crammed together for five days without food or water," she recalls. "We didn't know where we were going. Then we reached Auschwitz." Heisler's mother and grandfather were murdered at the concentration camp. She and her sister, sent on to a labor camp, survived on leftover potato peels. Now 93, the bright-eyed great-grandmother lives in a cozy apartment in Budapest, a city she proudly calls home. But she has no illusions about the role her country played decades before. 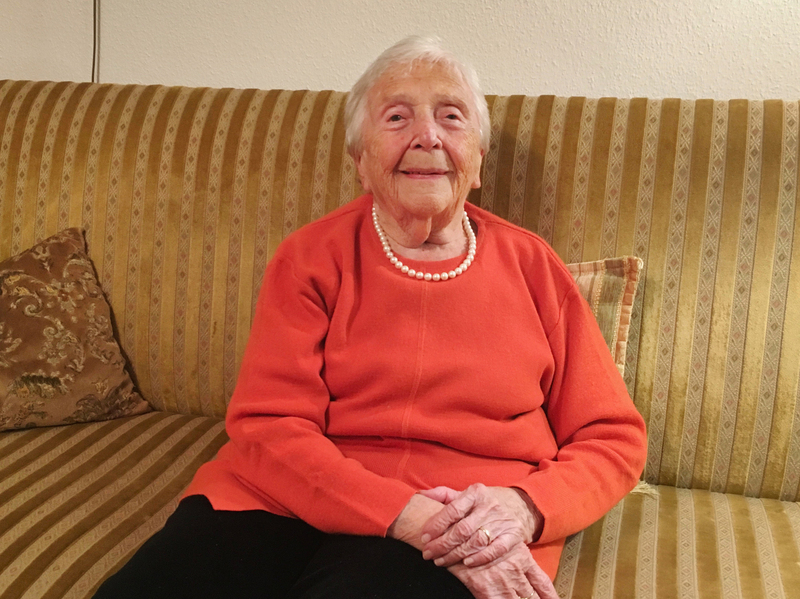 "We didn't see any German soldiers until we reached Auschwitz," she says. "It was Hungarians who deported us." She says Hungary has never been able to face its complicity. That's why she and many other Hungarian Jews are skeptical of a new Holocaust museum in development in Budapest, costing more than $23 million and financed by the Hungarian state. The building was finished in 2015, but unease over what it will present has delayed its opening in the years since. Heisler says the museum organizers want to portray Hungarians as "sin free" in persecution of Jewish citizens. Rozsa Heisler, 93, lives in a cozy apartment in Budapest. Nearly 75 years ago, Hungarian police forced her onto a train headed to Auschwitz, along with thousands of other Hungarian Jews. "Any museum that says this is not telling the truth," she says. A new study by researchers from Yale University, Grinnell College and the European Union for Progressive Judaism shows Holocaust revisionism is rampant in Central and Eastern Europe, with Hungary one of the worst offenders. "Hungary has gained the dubious distinction of rewriting history to rehabilitate war criminals and diminish its own guilt," the report says, noting the country "suffers from grave deficiencies in its Holocaust education, memory, and commemoration." Marcell Kenesei, a Hungarian Jewish educator, sees evidence of this revisionism just by walking the streets of Budapest. "If you go to the Szabadsag Square, or Freedom Square, here, you will see a monument commemorating the victims of the Second World War, showing Nazi Germany as the only perpetrator and Hungary as an innocent angel," he says, referring to a controversial statue that went up five years ago depicting Hungary as the Archangel Gabriel attacked by an eagle representing Germany. Hungarian Jewish leaders denounced the statue, but the nationalist government of Viktor Orban defended it. So did Maria Schmidt, a pro-government historian who conceived of the new Holocaust museum, called the House of Fates. The name is a twist on the title of the novel Fateless by Nobel Prize-winning Hungarian writer Imre Kertesz, a Holocaust survivor. 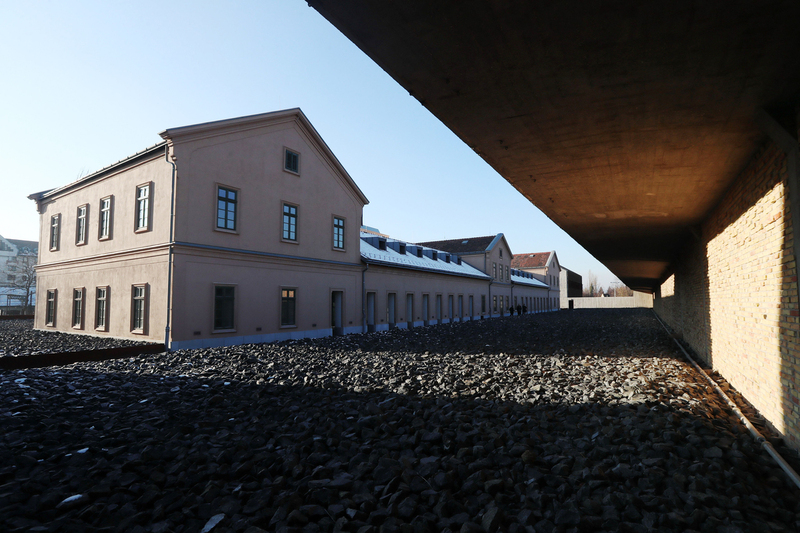 The museum is located on the site of the defunct Jozsefvaros railway station, where many Hungarian Jews were deported to death camps. A soaring Star of David between towers with facades resembling weathered rail cars marks the museum's entrance. Historians say the fastest deportations of the Holocaust took place in Hungary, where Hungarian police throughout the country worked with German authorities to send some 437,000 Hungarian Jews to death camps between May 15 and July 9, 1944. "They shouted anti-Jewish insults and threw things at us"
At the time, Hungary was led by Miklos Horthy, an admiral who became regent in 1920. His regime invoked a quota restricting the number of Jews who could attend university — the first government in post-World War I Europe to do so. The restrictions later included secondary school attendance. Heisler, who grew up in the Hungarian countryside, had to stop her education at the eighth grade. "I saw my non-Jewish classmates going to high school with their leather briefcases, in crisp uniforms, and I went to sew," she told a historian for an oral history. Horthy's regime closed down Heisler's grandfather's vinegar factory and sent her father to a labor camp. It passed laws rolling back equal citizenship, forbidding intermarriage between Jews and non-Jews and restricting the kinds of jobs Hungarian Jews could hold. "For all my life, I have been an anti-Semite," Horthy wrote to his prime minister in 1940, the same year his government joined the Axis alliance. Budapest's Dohany Synagogue is the largest in Europe. Heisler says that attitude spread throughout Hungary, and she recalls how neighbors and friends began to avoid her. "I remember the boy I loved at 15, the one who danced with me at the school ball, stopped talking to me," she says. "So did the daughters of the local police chief, who used to come around all the time." After the Nazis occupied Hungary in March 1944, Horthy ruled "in close conformity with German wishes," says Elizabeth White, a senior historian at the U.S. Holocaust Memorial Museum. Hungarian police forced Heisler and her family out of their home, marching them down the street to the train station. She remembers her fellow Hungarians cheering. "They shouted anti-Jewish insults and threw things at us," she said. "The few who felt sorry for us just shut their windows and drew their curtains." The Nazis eventually removed Horthy and replaced his government in October 1944 with the openly fascist Arrow Cross Party, led by Ferenc Szalasi, whose regime deported thousands more Hungarian Jews by year's end. Arrow Cross soldiers shot as many as 20,000 Jews on the banks of the Danube River and threw their bodies into the river. A memorial to the dead stands there today. Israeli divers have begun to look for the remains of the murdered. The House of Fates is located on the site of a former railway station that saw the deportation of tens of thousands of Jews during World War II. Pro-government historians today blame the worst anti-Semitism on the Arrow Cross regime but have tried to rehabilitate the role of Horthy, whom Orban has called an "exceptional statesman." Five years ago, Orban's government established a research institute, Veritas, aimed at examining "neglected historical periods and also setting right the ones which, in our view, have been falsely presented," Director Sandor Szakaly tells NPR. 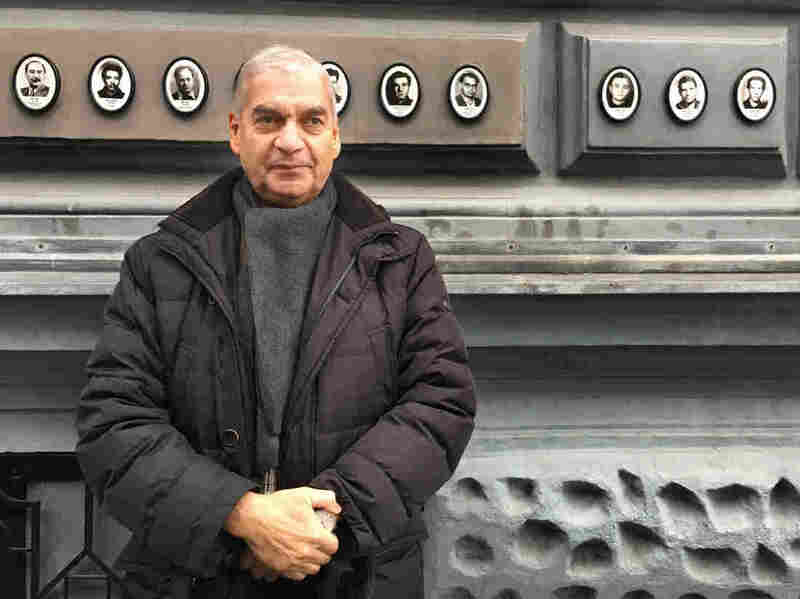 Szakaly argues that Horthy may not have immediately known that the 437,000 Jews his police force was rounding up and deporting after March 1944 were going to death camps. "When Horthy found out what was happening, he stopped the deportations and wrote a letter to Hitler saying this is unacceptable," Szakaly says. But Holocaust historian Laszlo Karsai, a professor emeritus at the University of Szeged, says the historical record shows Horthy knew everything. "He was informed about the final solution of the Jewish question by the Nazis," Karsai says. "And the main informant of this terrible secret was Hitler, when in April 1943, he informed Horthy that the Jews who cannot work must be perished, must be killed." Karsai says this fact must be included in Hungary's Holocaust museum. But he doesn't have faith that Schmidt, the historian who conceived of the House of Fates, will push to do so. "Maria Schmidt is a Holocaust revisionist," he says. 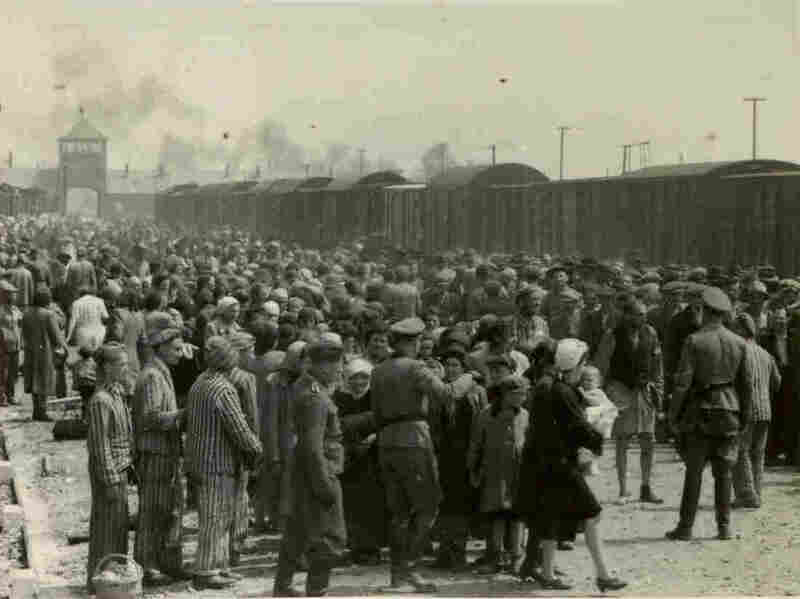 This picture released by Yad Vashem Photo Archives shows the arrival and processing of an entire transport of Jews from Carpatho-Ruthenia, a region annexed to Hungary from Czechoslovakia in 1939, at Auschwitz-Birkenau, Poland, in May 1944. To prove his point, he takes me on a tour of the House of Terror, a hugely popular interactive museum, also created by Schmidt, that examines four decades of communist rule in Hungary. In a room depicting the cruelty of the Arrow Cross regime during World War II, Karsai points out there's no mention of the Jews deported by Horthy's regime. "Not a picture, not a word, about this mass deportation, the biggest and fastest mass deportation in the history of the Holocaust," he says. Schmidt, based in Budapest, declined NPR's interview request. Her office sent a 2014 article she wrote for a conservative newsmagazine, in which she called the concept for the House of Fates "a story of love between Hungarian Jews and non-Jews" and expressed hope that it will show the "common fate shared by all Hungarians, Jews and non-Jews alike," during World War II. "The majority of the people do not want to hear about the Hungarian culpability, only Hungary as a victim," says Holocaust historian Laszlo Karsai, a professor emeritus at Hungary's University of Szeged. In the piece, she accuses "forces" of unfairly calling Hungary anti-Semitic and fascist "to discredit the Hungarian nation as a whole." She has said that the Nazis were no worse than Soviet communists and also compared Hungarian Jews deported during the Holocaust to ethnic minorities ejected from Hungary after World War II. "Didn't they live through the same personal tragedy?" she asked asked TV host Egon Ronai in 2014. Karsai says Orban's government is preoccupied with building a heroic Hungarian identity and so there's little appetite to face dark chapters in history. "If you speak about the Hungarian collaborators, if you speak about the participation of several hundreds of thousands of people in the persecution in Hungarian Jews, you are [seen as] an anti-Hungarian," he says. "The majority of the people do not want to hear about the Hungarian culpability, only Hungary as a victim." "We cannot accept any whitewashing"
In September, Orban's government handed over ownership of the House of Fates to the United Hungarian Jewish Congregation, an affiliate of the Hasidic Chabad movement. Orban's allies point out he is a strong ally of Israeli Prime Minister Benjamin Netanyahu. Rabbi Slomo Koves, who leads the Chabad group, says museums devoted to the Holocaust should not indict countries invaded by the Nazis. "I think the point of opening a Holocaust museum is to give a platform of digesting the past in a way where people can still look up to some of their ancestors," he says, "and some of the good choices of their ancestors and to learn from it and take from it the moral lessons that need to be taken." The government has said that it hopes the museum might open by May, the 75th anniversary of when Jews were deported to the death camps. But Koves says it may take longer. His group represents only a fraction of the estimated 100,000 Jews who live in Hungary today. 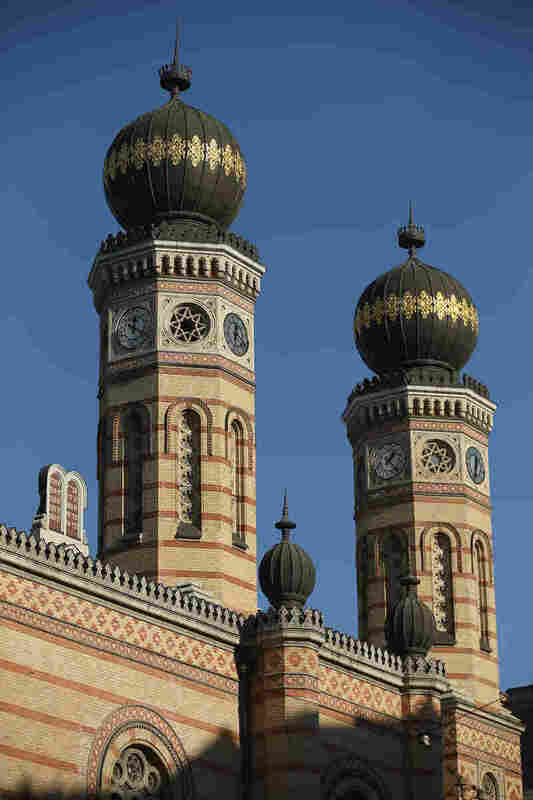 Most are in Budapest, home to Europe's largest synagogue. Just around the corner from that synagogue is the headquarters of the Federation of Hungarian Jewish Communities, an umbrella organization representing most of the country's Jews. Its director is Andras Heisler, the son of Holocaust survivor Rozsa Heisler. He says he is not comfortable with any Jewish organization running a Holocaust museum because "the remembrance of the Holocaust should not be responsibility of the Jews. Not Chabad and not us, either. It should be the responsibility of the whole society." Heisler also points out that Chabad is more focused on religion than on the Holocaust and says it has "no experts in the Holocaust, no practice in teaching the history." That history, he says, is nonnegotiable. "We cannot make any compromise," he says. "We cannot accept any whitewashing. We cannot accept any change of the history — because in the background, there are our grandfathers, fathers and relatives and 600,000 killed Jews." Heisler's own grandmother was among those who perished at Auschwitz. Her husband, who once courted her with cartloads of roses, refused to believe she was gone. After the war ended, he asked Rozsa: "Where did you leave your mother?" "He lived 87 years," she says now, "and he refused to declare her dead. He did not stop hoping she would come home." Journalist Mate Halmos contributed reporting from Budapest.